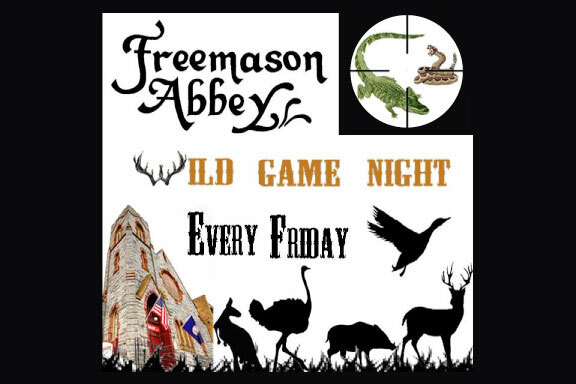 Every Friday is Wild Game Night at Freemason Abbey! We offer a variety of mouth- watering specials created by our Executive Chef every week. Let us paint you a picture… it is a cool fall evening and the sound of small stringed instruments carries well through the early evening air. The stars are untouched by the sound of the freeway or dulled by the harshness of the street lamps. Spread out on an opulent table are various meat dishes collected from the King’s forest for the fall festival. There is deer, hare, pheasant, boar and, the center-piece of it all, is a perfectly roasted peacock dressed in its feathers. Beginning in the Middle Ages all the way to the 19th century, game was not considered the delicacy that it is today. It was what the workingman could put on his family’s table for no more than the cost of a couple bullets and some gunpowder. Although more and more restaurants are offering some wild game on their menu, it is difficult to find a restaurant that does it as consistently and as well as the Freemason Abbey does. The two types of game are furred and feathered. Furred game includes buffalo, venison, elk, moose and wild boar. Feathered game pheasant, ostrich, quail, and guinea fowl. Many meats are compared to traditional beef cuts such as ostrich and kangaroo. Pheasant and other larger game birds share many similarities to domestic chickens but tend to be richer in flavor, like a Cornish game hen. Because these animals live a more holistic life, the dark meat of the duck, goose and other water fowl can be cooked to your desired temperature. So if you come into Freemason Abbey on a Friday night and see a featured special of grilled kangaroo, venison piccata, fried alligator, pheasant breast, or elk marsala, take a chance, try something that you’ve never had before. In 1387, King Richard II gave a dinner which included three tons of thirst provoking salted venison plus 400 rabbits, 12 boars, 50 swans and 150 pheasants, curlews and cranes. While you might not find all of that at the Freemason Abbey on a Friday night, rest assured we will have something fun and exciting for you to enjoy. Bon Appetit!